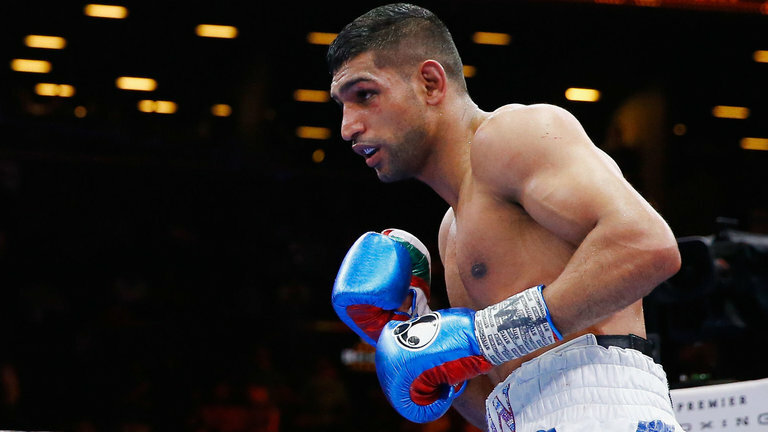 Amir Khan has revealed he is open to the idea of a fight against American Adrien Broner this summer ahead of a match-up with domestic rival Kell Brook. Khan, 31, moved to 32-4 (20) on the weekend with a 0:39 second demolition of Canadian Phil Lo Greco 28-4 (15) at Liverpool’s Echo Arena on Saturday night. The fight was contested at 150-pounds. “Broner is a big name,” Khan told the Manchester Evening News. “That would be a great fight. To bring him to the UK, now the UK market is massive where fighters from America want to come here. Cincinnati’s Broner 33-3-1 (24) also fought at the weekend, settling for a majority draw against former WBO welterweight champion Jessie Vargas 28-2-1 (10) at the Barclay Center in Brooklyn. Broner, who has won versions of world titles in four different weight classes, was originally scheduled to fight Omar Figueroa Jr in a WBC junior welterweight eliminator but Figueroa was forced to withdraw due to a shoulder injury. The Broner-Vargas bout was fought at the catchweight of 144-pounds. Despite weighing in at 150-pounds for the Lo Greco fight, Khan is insisting that a fight against Brook 37-2 (26) must take place at welterweight. Brook has only fought at 147-pounds once in the past two years, an eleventh round TKO loss to Errol Spence Jr in a fight for the IBF welterweight title in May last year. “Now we can talk about that fight,” said Khan. “Now me and Eddie can sit down and talk about that fight. “Let’s see if we can make the fight. Let’s see if he can make the weight because 150 was the weight I did for this fight, but I really wanted it for 147. Hundred per cent, it has to be at 147 if it’s going to happen.